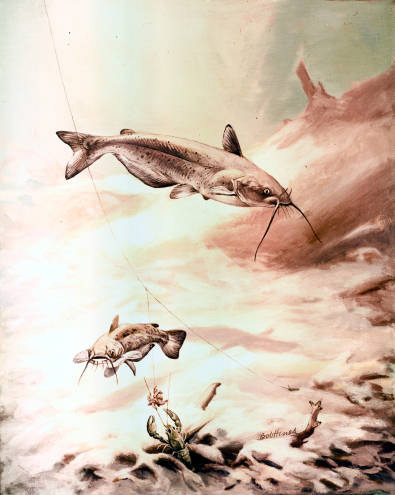 Channel catfish (Ictalurus punctatus); artwork by Robert W. Hines / USFWS Digital Library (public domain image). Channel catfish are bottom feeders (sometimes called spotted cat or fiddler) and can be found in most Tennessee streams and lakes. The most numerous catfish species in North America, with an average size between 2 and 4 pounds, the channel catfish can grow to 50 pounds or more (the world record was a channel catfish caught in South Carolina weighing 58 pounds). Found in rivers, reservoirs, natural lakes, and ponds throughout the United States, channel catfish are omnivores with a very keen sense of smell and taste. A channel catfish actually has taste buds distributed over the entire surface of its body, especially concentrated on the 4 pairs of barbels (whiskers) surrounding the mouth. These sharp senses allow the channel catfish to find food in dark or muddy water. 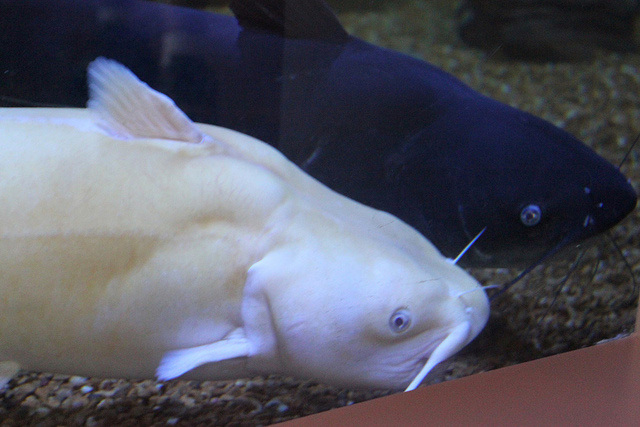 Two channel catfish (Ictalurus punctatus); The white catfish is not albino, but a unique color variation that is rare in the wild. Photo by Rebecca M. Krogman, USFWS / USFWS Southeast Region on Flickr (use permitted with attribution).